VietNamNet Bridge – A number of provinces across the country including Lai Chau, Nghe An and Tay Ninh are taking precautions to prevent forest fires as the dry season begins. Vuong The Man, deputy chairman of People’s Committee of Than Uyen District in the northern mountainous province of Lai Chau, said the risk of forest fire was high at the end of January. At the time, people often used slash-and-burn cultivation practices - the main reason for forest fires. Dieu Van Lien, party secretary of Na Phat Village in Phuc Than Commune, which has the largest forest area in the district with nearly 3,000ha, said local authorities would deal with anyone who destroyed the forest in accordance with village rules. Then fines would be issued depending on the number of violations. The fine for the first violation would be VND200,000 (US$8.6), VND500,000 ($21.5) for the second and VND1 million ($43) for the third. However, Lien said most local residents followed village rules. Lai Chau Province has more than 450,000ha of forests with a coverage ratio of nearly 50 per cent. Nguyen Van Bien, head of Lai Chau Province’s Forest Protection Division, attributed the growth of forest areas to the efforts of local administrations in forest protection and fire prevention. 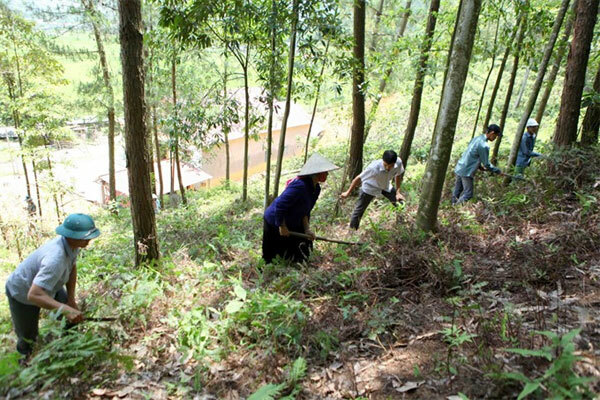 In the central province of Nghe An, the provincial People’s Committee has issued an instruction requesting heads of departments and agencies as well as the chairmen of districts to adopt measures to prevent forest fires. Tay Ninh Province near HCM City has taken a number of measures to prevent forest fires during the ongoing dry season. Ta Van Dao, deputy head of the steering committee, said the Lo Go – Xa Mat National Park, Chang Riec historical and cultural forest, Dau Tieng protected forest, Ba Den Mountain’s special use national forest, and forests in the border districts of Chau Thanh and Ben Cau have fire prevention plans in place. The Lo Go – Xa Mat and Dau Tieng, which normally suffer forest fires in the dry season, have built three more 33m-high watch towers. Tay Ninh has more than 70,000ha of canopy comprising special use forests, protected forests and forests grown to harvest timber. Most are situated on the Cambodia border.